Presentation Zen: Is it broken? From design to meaning: a whole new way of presenting? 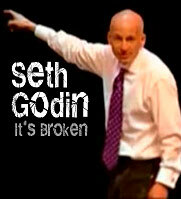 Seth Godin made a nice little presentation at GEL 2006. I like it. I think you will too. In case you are wondering, the name of the font Seth used in his slides is called "Shatterboxx." This font is perfect for his topic (Get it? Shatterboxx? Broken?). You'd never use this for text in a document, but for Seth's presentation it worked well. The font is for very large type, display type. His visuals were just that, visual. Listen near the end to what Seth says about Edward Tufte's favorite statistical graphic, Napoleon's March. Is it broken? 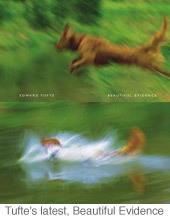 And speaking of Edward Tufte, what a treat it is to be able to hear an NPR interview about Tufte's new book. (The name of the book is Beautiful Evidence.) 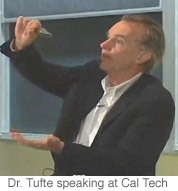 There is a short video clip of Tufte presenting at Cal Tech available there as well. I think Tufte is brilliant and I love his books. They are important books and I've learned a ton from them over the years. It's too bad, though, that he is known by many as the "guru who hates PowerPoint," because frankly, the Cognitive Style of PowerPoint essay does not meet his own high standards. Famous designer Don Norman has talked about Tufte on PowerPoint. "Pure nonsense," says Norman. "...accompanied by poor understanding of speech making and of the difference between the requirements for a speech-giver, the speech-listener (the audience), and for the reader of a printed document." Engineer Jean-luc Doumont also takes issue with Tufte on PowerPoint — Doumont published an essay called The cognitive style of PowerPoint: slides are not all evil. (APPLIED THEORY). You can download the essay from Amazon. Among other things, Doumont — an engineer with a Ph.D in Physics from Stanford — says that slides should be visual with clear messages and with "...as little text as possible." Still, I am a huge fan of Tufte's work. And I think that there is indeed something to the idea that PowerPoint — judging from what we have seen over the last several years — does seem to take people down the wrong road. But there are also many examples of people making wonderful presentation visuals with PowerPoint. Are these just the 10% of presenters who Tufte says are able to rise above the cognitive style of the PPT software? He implies that about 80-90% of presentations given with the aid of PowerPoint are pretty awful. On this we can certainly agree. The causes and the solutions, however, are a very different matter. Nonetheless, if you want good advice about the visual display of data for documents — books, handouts, technical papers, etc. — Tufte is the grand master. Is good PowerPoint design an oxymoron? Good design is possible with PowerPoint, so long as one knows a little something about design and how to best display information appropriate for their own unique situation. Basically, I think, as Tufte thinks, that PowerPoint is really no more than a tool for displaying slides. The only reason I use Keynote, for example, is because it does less, not more (though it does it more elegantly, smoothly, etc.). In the end it's not about slideware or about tools at all. In fact, your average student or business person would be better off buying some basic design books (like this one) rather than a how-to-use-PowerPoint book. Hell, taking Betty Edwards' 5-day drawing seminar will make people better "presentation designers" in the long run than a book on PowerPoint. What a wonderful year it would be if you could attend an Edward Tufte seminar and a Betty Edwards seminar in the same year. Now *that* would be an education. I'd love to hear from folks who have attended either of these seminars. If I were CEO of a large Silicon Valley company, I'd send my people to Tufte and Edwards, (Toastmasters, Bert Decker, etc.) and send my big presentation projects to Duarte Design. Tools matter, but better design education matters more. When the electricity goes off, who will remain the most effective communicators? As Alan Kay says, "Most ideas you can do pretty darn well with a stick in the sand." • The cognitive style of PowerPoint: slides are not all evil. (APPLIED THEORY). As requested: I went to a Tufte seminar last March and had a great time. From his books you know about his expertise on design issues; it turns out that he's an engaging, charismatic presenter as well. My only complaint is that he's arrogant: questions are tolerated, but barely, and dissent is absolutely forbidden. I think he's bought in to his own myth. Of course, that hasn't stopped me enjoying his books or applying his ideas to my work. Two examples of what I'm talking about: in the PowerPoint essay he recommends 'content-packed' handouts as a replacement for ppt slides; meanwhile, in *Visual Explanations* he recommends the Gill Sans typeface. So the handout we got at the seminar was set in Gill Sans, which is great for signs and headings but not for lots of dense text; and there was so much content that the page had practically no margins -- i.e., no space for me to take notes, and barely enough white space for my brain to decipher the type. Example no. 2: someone started heckling him at one point, challenging his PowerPoint argument, and Tufte lost his temper. I don't object to removing the heckler; any presenter would be within his rights to do that. But the rage was a little off-putting: it makes me wonder what would have happened if I'd said anything about his beloved content-packed handout. Thanks, Jeremiah. Appreciate it. Yes, I have heard about "the arrogance issue" from others (and frankly, this comes out in his books a bit too). Like you, though, they overall really enjoyed the seminar. But you're right, you can not show your anger, especially with hecklers or with those who challenge you. There was really a PPT heckler? Whoa. About Gill Sans, it does work well as a display typeface in print, but it *can* work very well for body text too. I bought a book called TYPE this summer that talked a lot about Gill Sans. I love the typeface. Check the handout on my website. How does it compare with Tufte's for readability? Your handout is more readable, definitely. You have outdone the master. :) If I had a scanner handy I'd send you an image of the seminar handout; it's pretty dense. BTW, after the heckler left Tufte said that Microsoft has been planting hecklers in his seminars to punish him for bad-mouthing PPT. I don't know whether there's anything to it -- he's *just* egotistical enough to have imagined it, and they're *just* evil enough to actually do it. I don't know about Betty Edwards's seminars (not really an option for people not in the USA I suspect) but I have been recommending Drawing on the Right of the Brain to my students ever since it first came out and those of them that followed it up have always said how many generally applicable skills they learnt from it. I attended a Tufte Seminar early last year. It was, overall, very informative and engaging. I agree with Mr. Hill, Tufte's charisma is quite high, yet he still manages to make you feel talked down to on occasion. I have used much of his teachings on displaying data (tables, charts, etc.) to great success and would recommend his books and the seminars to anyone - regardless of his arrogance (does this mean, he deserves, or has the right to be arrogant? No.). Now for the truly negative: The information "packet" one receives in receipt of a seminar is horrendous. The map generated is guaranteed to get you lost if you don't live in the town it represents. There were only about two sheets (including the map) in the envelope and, ironically, very little information regarding the seminar on either. I found it very odd, indeed, that this guru of information design would deliver such confusing and non-informative materials to attendees. I just signed up to take the Tufte seminar tomorrow in New York City. As a student, it's a great deal, because for $180, you get the seminar, and all of his books. ka-ching. Indeed, his publishing office seems a little slapdash in how they put the seminars together. Because I am a student, I had to fax in my registration (not trusted to register online I suppose...), and the form was a little unsophisticated. The office staff were in shock that I don't have my own fax machine (had to go to Kinkos), and made it seem like a big deal for them to to send an email with directions to the seminar within the next 5 hours. Oh well, looking forward to the seminar! I attended a Tufte seminar 2 years ago (I'm a student, so as Bill said the deal is great). I really enjoyed it overall. I've applied a great deal of what I've learned and it's played a major role in making me think differently about design and presentation. Not that it makes sense to take everything that Tufte says as gospel, but he does make a lot of great points. There weren't any major demonstrations of arrogance in the seminar I attended, but I can't recall anyone challenging him in any big ways either. I've written chapter-by-chapter reviews of the first three chapters of Beautiful Evidence. I'm planning to continue, but have been distracted. The short of it is: this book is a big disappointment. Tufte overstates, he cites obscure texts seemingly for the sake of appearing worldly, and he misses out on so many opportunities. Sparklines is a true innovation worth lauding, but the rest has been quite lame. I attended ET’s “Presenting Data and Information” seminar in July. I am a big fan of his first three books, had read the chapters of Beautiful Evidence ET had posted online, and was looking forward to the seminar. I was disappointed. I felt the seminar was aimed at upper level management who had never read the books, never had a public speaking course, and needed some ideas to direct their design team. He offered good suggestions for designing and presenting, but nothing revolutionary or that different from many other sources. For example: Respect the audience instead of know the audience, because ET thought “knowing” led to focusing on negative traits. ET’s PPT rant was well laid out, but tired. He sounded like a computer-illiterate retro-grouch half the time. To avoid the pitfalls of PPT he focused on requires 5-10 minutes working with slide masters, design sense, and skills in communication, neither of which ET even touched on. He drew his examples from NASA, which he admitted was an extreme case. (I’m lucky, because I do not work in a PPT-driven-meeting culture). On the other hand, ET is a very impressive speaker. His delivery is smooth, well practiced, but never sounded like he was reciting from memory. And he has the ultimate hand-outs with his books! The handout for the seminar was, of course, a folded 11 x 17 sheet. Page 1 is a schedule, and reading suggestions from all four books by topic of interest (web site desing, financial data, displaying technical data). Page 2 is “Some 20th century classics of information architucute,” a paragraph each about 11 examples including Peterson Field Guides and the Vietnam Memorial. Page 3 is nothing more than an unorganized listing of topics from the Ask E. T. forum. Half of page 4 is devoted to sales of his prints, books, and sculptures. The other half is a brief bibliography of analytical design resources. On Mac OSX there is a standard system font available which has a similar effect as the Shatterbox font used by Seth. It's called "Cracked".